Student nurses: When is a nurse a student? What it means to be a “student nurse” has changed a great deal over the lifetime of the NHS, with the expectations, status and rights of student nurses changing between 1948 and the present day. Prior to the NHS, nurse training had varied markedly according to where you were trained and what kind of hospital it was. The first general training school for nurses had been founded at St Thomas’ hospital by Florence Nightingale in 1860 and it was largely her ideology of service and discipline that dominated nurse education into the 20th Century. However, the exact form in which those ideas were communicated varied greatly, with no common state registration for trained nurses coming into force until after the Nurses Registration Act of 1919. Mental health nursing education and registration was also kept separate from that of general training, reinforcing the marginal status of work with the “insane” in that period. After 1923 becoming a state registered nurse involved three years of training followed by an exam. However, since the training was largely vocational and the content determined by individual matrons, experiences varied wildly. For those undertaking this training its main feature was work and discipline. Regarded as “probationers” rather than students, after a brief preliminary period, student nurses took on a full workload, including everything from cleaning to clinical care, under the supervision of ward sisters. Resident in the hospital’s nursing home, their movements, conduct, manners and morals were constantly controlled under the matron’s disciplinary structure, Probationers that fell short of the expected standards – perhaps by not returning to bed at the stipulated time or by getting caught smoking – were often sanctioned and, if sufficiently unruly, sometimes asked to resign. The Nursing Reconstruction Committee, led by Dr. Thomas Horder, spent 8 years investigating the system between 1942 and 1950 and reported that nurse training was placing too great a burden on probationers. After just 3 months of preliminary training nurses became indispensable staff, often with little support (something reflected in Helen Bissett Reid’s memories of nursing training in the 1940s, which you can read here). Hours of work were also a stretchy concept, with students expected to keep working until all their duties were completed regardless of how long it took, and then to attend classes in their spare time. Little social life was permitted and living out of the nursing home usually forbidden, making nurse training virtually incompatible with married life. This, the Horder Committee concluded, led to 54 per cent of nursing recruits dropping out before they completed their studies. In the early NHS then, “students” were (according to the Horder Report) less nurses in training and more “junior employees [under] an outworn system of discipline”. Horder recommended the end of the harsh disciplinary regimes typical of nurse training, a reduction in the amount of domestic labour required from students, an improvement in food and accommodation, and the introduction of fixed shifts and more training. But it wasn’t just the Horder Committee that put pressure on the government to improve things in the late 1940s. In fact, student nurses at St. Mary’s Hospital, Plaistow, greeted their first NHS pay packet with considerable dismay. Despite receiving a small pay rise, an increase in National Insurance and pensions payments meant that the students pay packets were even smaller than before the founding day of the new service. An uproarious public meeting was organised at which 600 student nurses from hospitals across the East End all agreed to sign resignation letters and hand them in if the Regional Health Board didn’t take action on hours, exam fees, holidays, travel expenses and, above all, their pay decrease. At the heart of the students’ complaints was a problem that would dog nursing training and students for much of the twentieth century, namely: whether student nurses were mainly students or mainly nurses. Hospitals needed cheap nurses. Students needed a wage. 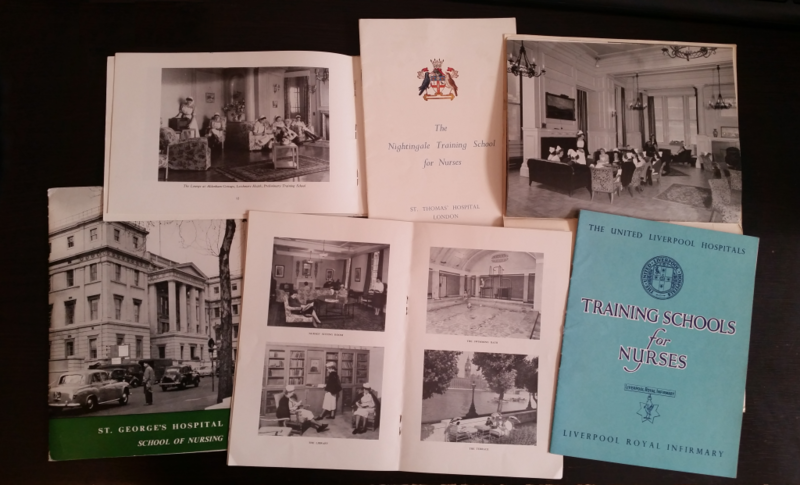 But the Royal College of Nursing (RCN) was keen to establish the professional status of their members and thus emphasised the educational status of new recruits. Indeed, the RCN’s ideal in this period was that students should work unpaid, receiving a training allowance instead. The 1950s and 1960s featured recurrent divisions over the issue of student status. NHS pay and conditions in this period were determined by national negotiations on a “Whitley Council” comprised of NHS management and representatives of staff (mostly from the RCN). The RCN’s position on students remained largely that what they did was education rather than work and that therefore wages were not a primary concern. Meanwhile the expectations of what student nurses should do were gradually beginning to change. 1948 had seen the introduction of a new category of nurse, the state enrolled nurse (SEN), which created a category of employee expected to have less training (and less prospects) who would now be expected to do the least skilled and worst paid jobs, partially freeing students up to learn. Such positions were increasingly filled by immigrant women (often from the Caribbean) often specifically directed into SEN training by the Ministry of Health. As on many other occasions, the exploitation of (primarily) black and Asian workers helped the NHS overcome its structural shortcomings. Even still, by 1960, student nurses were still doing three quarters of all hospital nursing work, with registered nurses (SRNs) mainly taking supervisory tasks. Although their role as cheap labour stubbornly clung on, cultural changes made the kind of discipline and living arrangements featured in nursing training increasingly untenable. Gradually, with the organisation of proper shift systems, nursing students’ out-of-work lives were subject to less control and the expectation that students would live in and be at the beck and call of the ward sister became less firm. By the 1970s many of the social and cultural restrictions placed on student nurses had declined. It was at this point, with the position of the student nurse shifting under the impact of changing attitudes towards gender roles and work more generally that nurse training shifted towards universities. In 1972, the first nursing degree was established at the University of Edinburgh, and in 1974 nurse training was reorganised to encourage the spread of nursing degrees. Nurse training gradually moved towards something more like its modern incarnation, with a split between degrees and diplomas, with access to the former partially determining access to higher grades and specialised nursing. In recent decades, the RCN’s original idea that nurse training should be considered education for a professional role, rather than as trainee work, has largely won out. Much of the less skilled labour that “probationers” used to do has been largely shifted to other groups of hospital workers (like healthcare assistants). Degree students presently receive means-tested maintenance grants to support their study (just as the RCN demanded back in the 1940s), and their training is approximately half practice and half theory. However the government has plans to abolish the “NHS Bursary” – plans that students, unions and professional organisations have, like their 1940s predecessors, organised demonstrations against, through the Bursary or Bust campaign. Susan McGann, ‘No wonder Nurses quit! What the new health service meant for nurses in 1948’ in Chris Nottingham (ed. ), The NHS in Scotland : The legacy of the past and the prospect of the future (Aldershot: Ashgate, 2000), pp. 34-48. I commenced a newly created combined SRN, RSCN and Obstetric Certificate four year nurse training in 1970. When on the wards which seemed to be most of the time we did a 42 hour working week and we definitely did work. Not that long into out training we were left in charge of wards at night. We had to live in the nurses home for the first 12 months. We had to kneel down in front of our tutors for them to check that they touched the ground. My first months ‘wages’ was £28 and I had to buy my uniform shoes and cardigan out of that. Although my lodging was included we had to pay for our own food. When I claimed my NHS pension I was annoyed to be told that I didn’t get any pension for those four years as we weren’t classed as an employee. I finished my training at the end of 1969. I did my training in what used to be a Poor Law workhouse. We worked a 40 hour week with many split duties and one weekend off every four to six weeks. The wards were mainly 40-44 bed nightingale wards. There was a sister or staff nurse working opposite shifts that did mainly the administrative work. On the ward there were four student nurses and a ward orderly. It was often back breaking work especially on the medical wards. We did the orderlies work when she was not there, and the portering when porters were in short supply. Days off and change of shifts were changed a minutes notice because of the exigencies of the ward or department. When I was still a second year nurse I was put on night duty with a student nurse nun on a 40 bed medical ward. We had three deaths on the first night. There were two trained nurses down the corridor in an office covering ten wards. They would do a round at night and come to dispense the DDA’s as required. The female nurses received 11 pounds a month living in with board and lodgings. The male nurses such as me received 22 pounds per month living out. At first, we could go to the staff cafeteria and have a meal anytime. This later change to a system of “pay as you eat for which we received an allowance” to cover only meals take on duty. We were hard worked and poor, and most definitely together with the SEN’s the backbone of the nursing labour force. In another note I will tell you of my experiences with “get the nurses to do it” when those whose duty it was were either not there to do it, or did it badly so it was shifted onto the nurses. I have just recently heard that my mother (Elizabeth Brennan) trained as a nurse in Aldershot in the 1940s. She was from Ireland so don’t have much information as to how long she stayed in UK. Any help would be great as to how to go about getting more information if there are any nursing records held. http://www.nationalarchives.gov.uk/hospitalrecords/ . Another possibility would be to make contact with the lovely archivists at the Royal College of Nursing, here: https://www.rcn.org.uk/library/archives. Good luck, and do let us know what you find!